The new coupler is uniquely designed for systems applications where external leveling, precise monitoring, signal mixing or swept transmission and reflection measurements are required. They also provide many solutions for other applications including electronic warfare (EW), commercial wireless, SATCOM, radar, signal monitoring and measurement, antenna beam forming, and EMC testing environments. Compact package measures 1.40 inches (L) x 0.40 inches (W) x 0.66 inches (H), and weigh just 1.0 ounces. 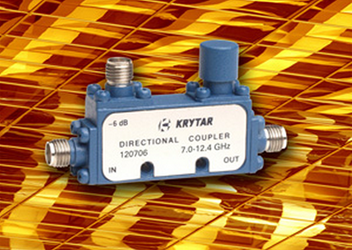 New directional couplers can be manufactured to meet ridged military specifications. For more features and specifications on the 120706 model, download the datasheet.